With Rio’s street vendors selling everything from sunglasses to flip-flops to selfie-sticks; here is a quick guide to the best street food that can be found on the streets of the Cidade Maravilhosa. RIO DE JANEIRO, BRAZIL – It’s hard to go for a walk anywhere in Rio without seeing at least one street food vendor. And as many tourists will know, if you’re strolling along Copacabana beach, there seems to be one every couple of steps. So here is a handy culinary guide to the best street food that Rio’s vendors have to offer. Tapioca has become popular world-wide as a healthy gluten-free alternative to bread, and in Rio it is often served on the street in both savory and sweet forms, as a breakfast food or a quick lunchtime snack, photo internet reproduction. Possibly the most surprising street food in Rio is pipoca. While nearly everyone who has attended the cinema can vouch for popcorn’s moreish qualities, the type served up on Rio’s streets is particularly delicious. Often freshly cooked and with the option of sweet or savory – or, for the particularly adventurous palette, ‘meia-meia’ (half and half) this cheap and delicious snack often comes fully-loaded with extras. Look out for a particularly special vendor outside the ‘Museu de Ciências da Terra’ (Earth Sciences Museum) in Urca, where they serve half-sweet half-savory, mixed with fried cubes of crispy bacon and decadently smothered with condensed milk. A favorite with children of all ages, this is the Brazilian variation on the classic Iberian doughnut. A churro in Rio usually comes stuffed with either ‘doce de leite’ (caramelized, condensed milk) or melted chocolate, and then it is often rolled in cinnamon. Again, this street snack is often freshly fried to order, and churros vendors can be seen up and down the beaches of Zona Sul (South Zone), such as Copacabana and Ipanema. A popular breakfast dish, tapioca crepes are one of the most versatile street foods to be found in Rio, with an array of sweet and savory combinations often displayed on the vendor’s cart (sometimes with additional English translations in the more tourist-friendly areas). 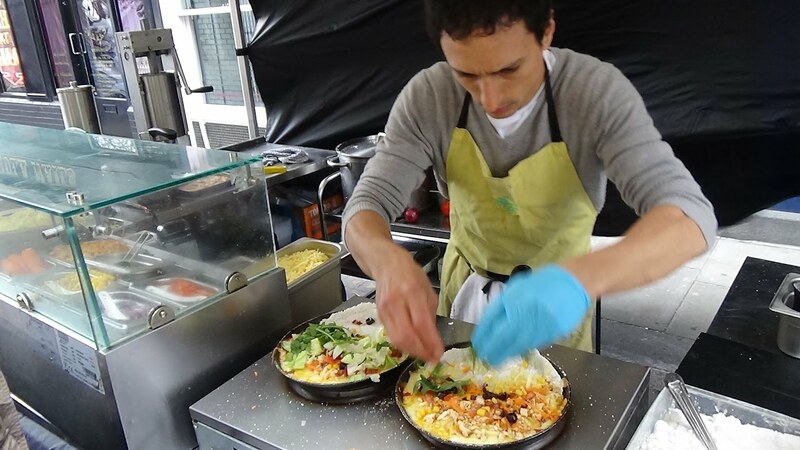 This street food has the added advantage of being relatively healthy in comparison to both pipoca and churros; however, this can often depend on what you decide to fill it with. At its most simple, the tapioca can be simply buttered and eaten like toast – or otherwise it can be stuffed with ham, cheese, or chicken, for a savory snack, or banana, coconut, or chocolate, as a sweet dessert. Popular carioca options are the savory-sweet combination ‘romeo e julieta’ (cheese with guava paste), ‘banana e chocolate’ (banana and chocolate), or ‘frango e catupiry’ (chicken and cream cheese). These crepes are also popular for being vegan and gluten-free. Acarajé is most popular in Rio’s North-Eastern region, though it can be found in many of Rio’s food markets; it is also used as a ritual food in Afro-Brazilian religions, such as Candomblé, photo internet reproduction. Acarajé is probably the one street food in Rio that has no European or North-American equivalent. Similar to Brazil’s national dish, feijoada, acarajé is a food that also tells the story of the Brazilian nation. The dish was bought to Brazil from West Africa by slaves and consists of a ball of mashed, deep-fried beans, filled with two pastes made from cashews, palm oil, chilli, tomatoes, and other ingredients and spices, and then usually stuffed with small shrimp. A popular dish in the North-East, acarajé is available on the streets of Rio, often served by women dressed in all-white cotton dresses and headscarves, the traditional clothing of North-Eastern Brazil. Two great spots for acarajé are in the square outside of the Carioca metro station in Rio’s city center, and outside of Glória metro station in Rio’s Zona Sul. 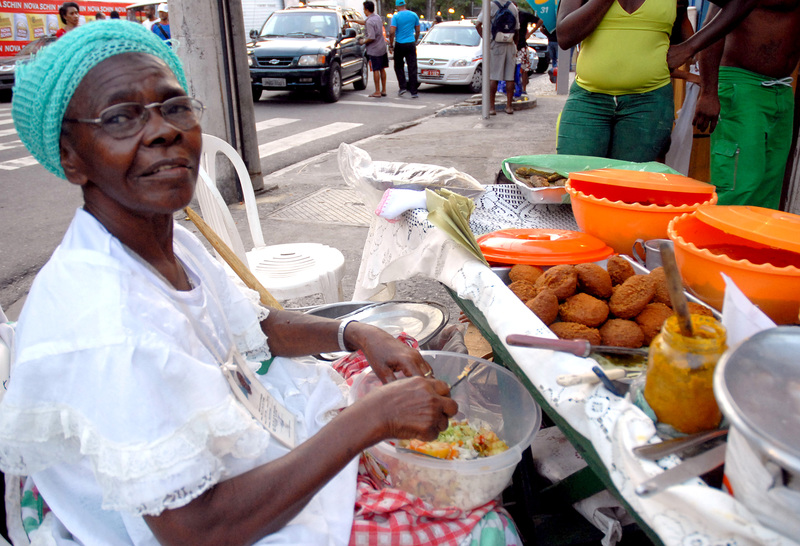 “The acarajé food stand in front of Glória metro station is my favorite spot. It’s a good price, serves generous portions and is delicious.” comments Julia Vieira, from Glória. This Brazilian cachorro quente is unlike any other hotdog. With the emphasis heavily on toppings, the cheap, boiled frankfurter-style sausage often comes layered with sweetcorn, olives, potato chips, and even quails’ eggs, plus a dizzying array of sauces. Not for everyone, this classic junk-food snack is often celebrated in special ‘Podrão’ food festivals that have been launched in opposition to the more artisan, healthy snacks now cropping up in Rio’s restaurants and street-corners. Over the years my friends and I spent tens of thousands of US dollars on accomodations, shopping, dining and tourist attractions in Rio de Janeiro. However, we have decided not to return until the Rio government does right by the poor people living in the favelas and stops the state-sanctioned executions of black and brown Brazilian citizens.